"An event is to be held on October 1 at 7:30pm at the Fabrica Moritz in Barcelona: a discussion among the expat community about the independence of Catalonia and how it affects [expats] in particular, followed by a networking session to relax and chat more informally. 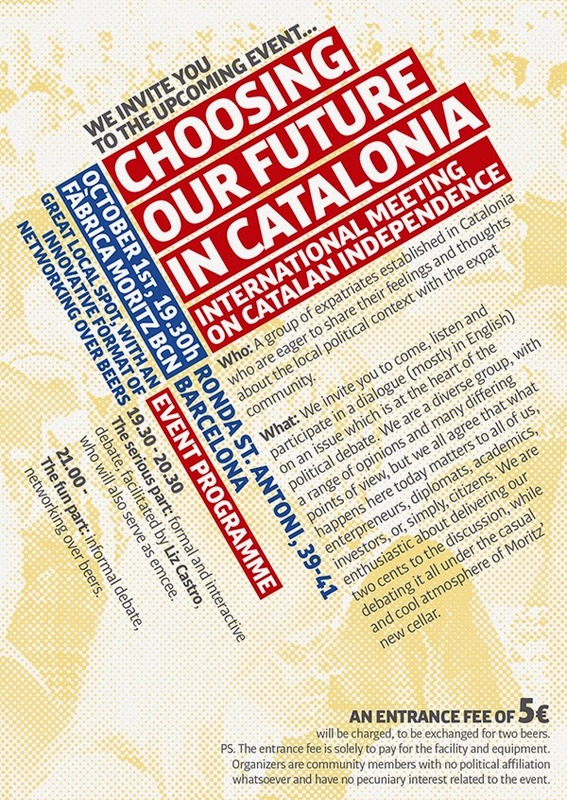 The panel discussion will include Maarten de Jongh, Corporate Finance Advisor, originally from the Netherlands; Krys Schreiber, International Press and Communication Consultant, originally from Germany; Martha Moreo, Business Administration and Musician, originally from Argentina of Italian origin and it will be chaired by Liz Castro, editor of What’s up with Catalonia?, originally from the United States. There is a $5 cover charge at the door which includes two beers, and covers the expenses of the hall. See flyer poster above for more general information."